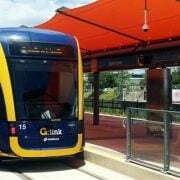 The iconic monorail that has run between the Oasis Shopping Centre and Jupiters Gold Coast will officially cease operation this Sunday evening – after nearly three decades of operation. But, as a final hurrah, the owners are inviting everyone to enjoy a free ride on the monorail this Saturday and Sunday. Oasis Centre Manager Rosalind Blandford says: “We are celebrating all things monorail with a two-day community event at the Oasis Centre on Saturday 28 and Sunday 29 January. After nearly three decades of operation, the day-to-day reliability of the monorail system has diminished, and the cost of running and maintaining the infrastructure has increased significantly. So, with patronage declining and maintenance requirements increasing, Oasis Shopping Centre, which operates the monorail, made the decision to discontinue the service. The removal of the monorail also enables the shopping centre and Jupiters Gold Coast to consider new development opportunities that will “continue to the revitalisation of Broadbeach and the precinct it will become.